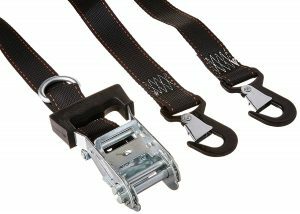 Looking For The Best Tie Down Straps For Motorcycles? 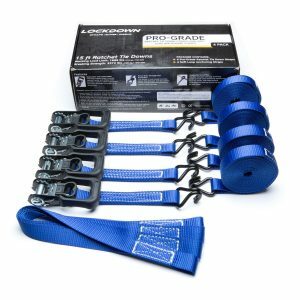 Here’s a look at our favorites, including our top pick – PREMIUM LOCKDOWN RATCHET STRAPS-15 ft. Length-BEST IN CLASS 3372 lbs. Max Break Strength. I have to admit that every time I strap my motorcycle onto the bed of my truck, my brain runs through every possible negative scenario in the book (and I mean every scenario, from scuffs and scratches to bouncing out of the bed and causing a 27-car pileup on the freeway). I invested in a good set of straps a few years ago, and since then I haven’t gotten a single scratch or scuff in transit, nor have I seen my bike move an inch whenever I check it in the rearview mirror. In my opinion, buying good straps for your motorcycle is one of the best investments you can make to protect your bike. Let’s take a quick step back from talking about motorcycle straps. If you’ve ever tied anything down to a truck or trailer, you know there’s a difference in quality when it comes to straps. We’ve all helped that friend move their refrigerator and cringed when they pulled out bungee cords from the dollar store. If you didn’t make the commitment then, it’s time to make it now—never use shoddy straps to tie anything down. It risks damaging your property, and even worse, it risks an accident that may injure other drivers on the road. Back to the topic at hand. 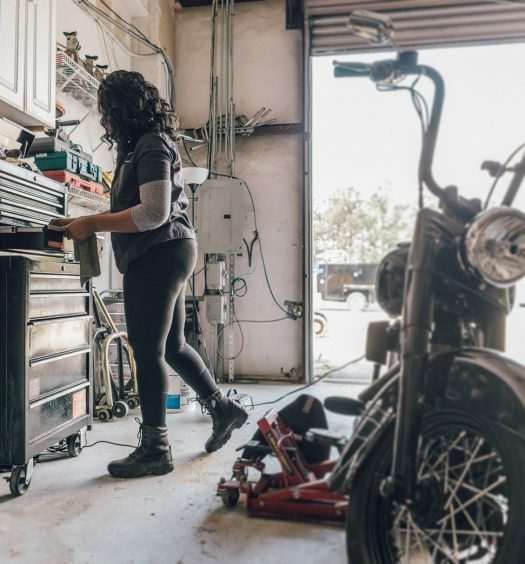 When you tie down your motorcycle, it’s a balancing act between securely locking down your cargo and making sure the straps, ratchets, and S-hooks don’t scratch or scuff the paint and chrome. 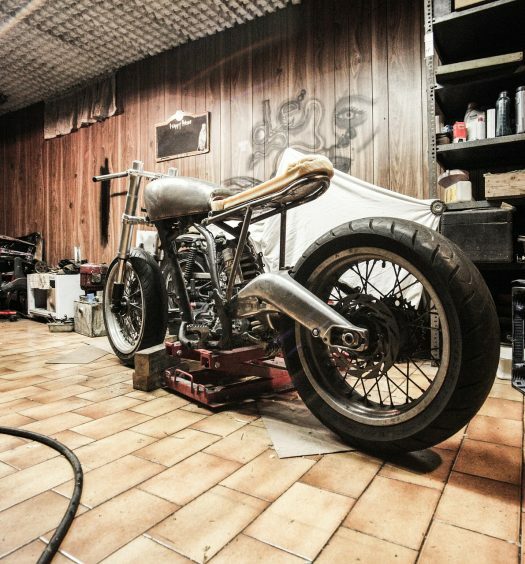 It doesn’t help that motorcycles are awkwardly shaped and weighted—you’ll need some straps to anchor down the bike, and you’ll probably need some straps to hold the handlebars still so that the front wheel doesn’t shift during transport. Strength and resistance are king, with durability and longevity as close runners-up. 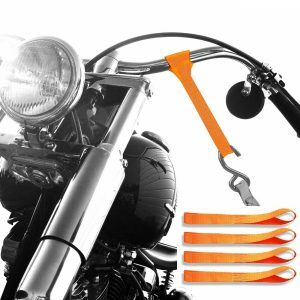 Premium Lockdown Ratchet Straps offer the heavy-duty strength and durability to keep your motorcycle strapped in and locked down the entire ride. The large, molded finger-through handles and release levers provide added leverage for optimal strap tensioning, and they make it comfortable to operate. The extra-large stitching reinforcement and double J-hook design ensure your motorcycle is safely anchored to the truck or trailer, and the oversized straps are constructed with webbing that’s wider and almost twice the size of standard straps. Rhino USA is a father & son business out of California, and I’m always a fan of supporting small businesses that produce great products. 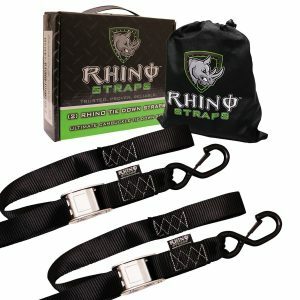 Rhino straps have full-bend S-hooks with spring loaded keeper clips for additional safety. They’re designed to fit all handlebars and frames, and the S-hook design make them easier to use in tight spots where standard hooks get stuck. All Rhino USA products come with a lifetime warranty, and they offer a full refund if you’re not 100% satisfied. Keeper’s heavy-duty soft-tie ratchet tie-down straps guarantee long-term durability, wider webbing (1 ½”), and superior load capacity for motorcycles and ATVs. Keeper’s intergraded soft-tie application means you don’t need to rely on hooks to hold down your motorcycle. The steel D-rings are sewn in place for secure hook attachment, and the setup works great with roll bars, composite racks, and oversize bumpers. The snap hooks are vinyl-coated for optimum safety and security, and the hooks lock on to the anchor points and sewn-in D-rings. They have an oversized molded handle and ratchet that provide a superior grip and leverage, making tightening the straps a whole lot easier. The handles lock into place during transit, and they open 180 degrees when released. 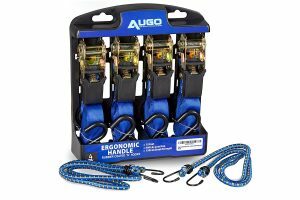 Augo’s Ratchet Tie Down Straps have a unique design that uses a proprietary molding technology to make sure their handles never fall off. The S-hooks are rubber-coated, so you don’t have to worry about scratching your motorcycle, truck, or trailer. At 15-feet-long, they’re big enough that you’ll never have to worry about stretching or running out of slack. They’re durable, designed to withstand everyday wear and tear, and they’ll never fray, so you can count on them for long-lasting performance. This pack also comes with two Augo bungee cords for added convenience. These straps may be “Badass,” but they’re surprisingly soft enough to protect the paint and chrome on your motorcycle, truck, and trailer. The company asserts that they’re the strongest soft-loops that you can buy, and based on the stats I might have to agree with them—the regular size has an 1,800-lb. safe workload with a 7,300-lb. breaking strength, and the extra-large set has a 3,667-lb. safe workload with an 11,000-lb. break strength. The straps have non-scratch webbing, reinforced triple diamond stitching, and are UV resistant so they don’t dry out in the sun. 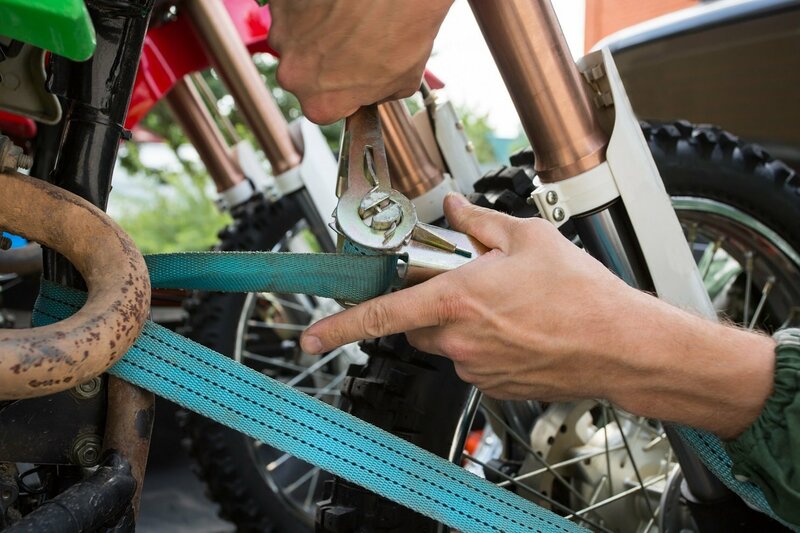 They’re easy to install, and they fit great on handlebars, forks, swing-arms, and tight spots where ratchet strap hooks generally can’t go. The straps come with a lifetime warranty, so if they ever break (which I doubt they will), the company will send you a brand-new set—even if the break was your fault. I’m personally a fan of S-hooks that have a locking mechanism, so I’m partial to the Keeper and the Rhino straps. That said, the Augo and Lockdown ratchet straps are equally strong, dependable, and long-lasting. I wouldn’t recommend using the Badass Moto Gear straps exclusively as they don’t have a ratchet, but they’re great to use in combination with other ratchet straps.